Stella McCartney "Smooth & Lace" bikini briefs. Lace back with scalloped lace edges. For in-store inquiries, use sku #2180482. Chantelle Style 2154 "Segur" hipster in semisheer mesh and lace. Mid-rise sits across hips. Moderate seat coverage. Flat elastic edges helps style stay in place. Cotton-lined gusset. Nylon/spandex. Imported. Designed in France. 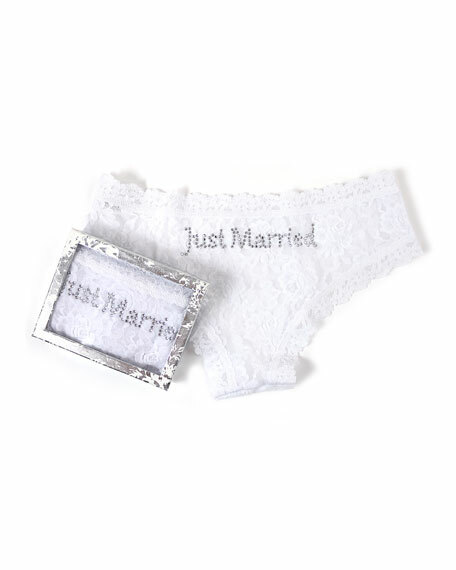 Hanky Panky cheeky hipster briefs in signature super-soft, stretchy lace. Arrives in silver gift box, perfect bachelorette party gift. Rhinestone "Just Married" studded across front. Low-rise, scalloped waist. Partial seat coverage. Banded edges. Nylon. Imported.